Metropolitan Chairman Randy Record, KTLA reporter Wendy Burch, Inglewood Mayor James Butts and Metropolitan Director Gloria Gray (L-R) are live on the air for unveiling. Metropolitan recently commandeered Randy’s Donuts iconic sign to showcase the ongoing need to save water during this record drought. The big donut atop the bakery near LAX has been cloaked for several days with the supersized centerpiece red knob of Metropolitan's "Turn" water awareness advertising and outreach campaign. It's only the second time in 62 years that the donut has been transformed. The first time was for the L.A. Kings during the Stanley Cup finals. The recent early morning unveiling attracted much attention and extensive news media coverage, including several live reports from Randy's by KTLA-TV, including the moment Metropolitan Chairman Randy Record blew an air horn to set the unveiling in motion. Metropolitan staff received many water-saving pledges from event attendees, who received a complimentary donut in return. Watch a time-lapse video of the event, see what the news media had to say, and read what was said on Twitter and Facebook. Metropolitan has teamed up with digital radio stations Pandora and Spanish-language Uforia to create a music-streaming playlist of songs that are timed to help you take a shorter shower. The 100-plus song compilation contains many contemporary hits and oldies about rain and water. 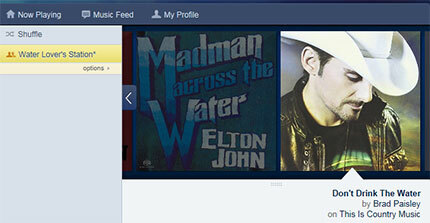 The playlists are the latest addition to Metropolitan’s current #TakeATurnCA water conservation campaign. Read the news release, listen to the station, and view videos of the playlist. 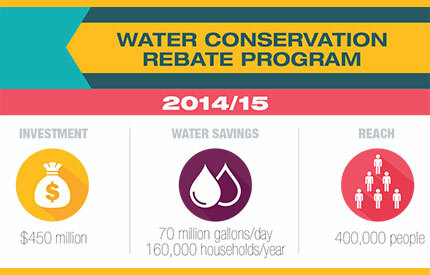 Metropolitan has created a new simple and easy-to-follow brochure about its water conservation rebate program. It describes the various parts of the conservation program through a series of attractive infographic displays. For the first time since 2001, the size of Metropolitan's Board of Directors has changed. The change is due to the latest certified assessed valuations of taxable property in the district’s six-county service area. Under the Metropolitan Water District Act, each of the district's 26 member agencies is guaranteed at least one board member, and can appoint an additional representative for each 5 percent of assessed valuation of property within the district’s boundaries. The city of Los Angeles gains the additional seat, increasing its representation to five members, the largest of any member agency. 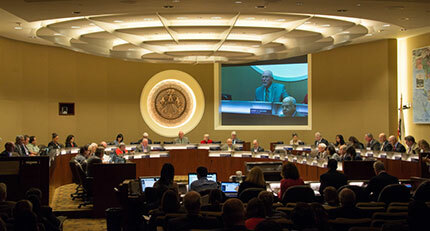 The San Diego County Water Authority and the Municipal Water District of Orange County each has four representatives.